THE ANGEL LIST IS HERE! The Henry F. Selcer Memorial Empty Stocking Fund has been making Christmas brighter for Harrison County families since 1914 when Elizabeth Scully, a grocers daughter, noticed how many families came in the store that were in need of help. Through the years, the Empty Stocking Fund has grown to help thousands of children on our area each year. 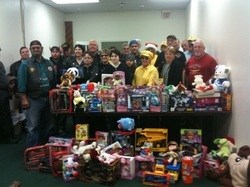 Thank you to everyone who helped make Christmas a joyous time for many, many children in Harrison County. Please check back in the fall of 2019 for more information about the next toy drive!